Born free in Washington County, Pennsylvania 1826, Alexander Clark moved to Bloomington, Iowa (later known as Muscatine) at age 16. He arrived with training as a barber, a trade which allowed him into the company of Bloomington’s leading citizens. He purchased property quickly, and supplemented his income by clearing the land, selling timber to steamships, and growing vegetables for sale. In 1848, at the age of 22, he was able to purchase a fine home in an affluent neighborhood, which stands to this day. 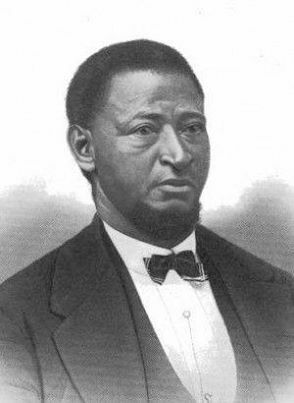 The same year, as a trustee of the AME Educational and Church Society, he was able to procure funds, purchase land, and help to build the AME church in Bloomington. Since both his wife and mother were former slaves, Clark took a keen interest in the abolitionist movement. He became an anti-slavery speaker soon known as the Colored Orator of the West. Clark also assisted fugitive slaves being sheltered by the Underground Railroad with donations of food. Notably, he sheltered a local man named Jim White in his home. When the owner attempted to claim him, Clark helped the fugitive escape. After the Civil War began, in 1863 Clark helped to organize the 60th Iowa Colored Troops, originally known as the 1st Iowa Infantry, African Descent, a regiment which eventually had about 1,100 soldiers. Ineligible for service himself due to a disability, he turned over his $2 commission per recruit to the men themselves. Following the Civil War, Clark began the campaign to enfranchise black men in his state. His efforts were successful. In 1867 U.S. Senator John Crookham of Iowa successfully lobbied the state’s legislature to have the word “white” stricken from the state constitution. Later that year Clark sued the Muscatine Board of Education on behalf of his 12-year-old daughter Susan, who was denied entry to the white-only school near their home. The case went before the Iowa Supreme Court which ruled that racial discrimination in Iowa’s public schools was unconstitutional. Susan enrolled in the formerly all-white high school in fall 1868. This successful case 86 years before Brown V. Board of Education influenced the 1954 decision. A number of Brown briefs in that landmark judgment would cite the Clark case. In 1884 at age 58 Clark became the second African American graduate of the University of Iowa Law School. He followed his son who became the first graduate in 1879. After earning his law degree, Clark moved to Chicago, Illinois and purchased and edited the Conservator. Clark then moved to the East Coast where he worked as an attorney. He corresponded publicly with his longtime friend Frederick Douglass. Through letters published in newspapers they spoke warmly of their 40-year friendship. President Benjamin Harrison appointed Clark U.S. Ambassador to Liberia in 1890. Alexander Clark served less than a year there. He died in Monrovia, the capital, in 1891. He was 64. Clark’s body was returned to Iowa and buried in the Muscatine Cemetery. Robert Bruce Slater, “The First Black Graduates of the Nation's 50 Flagship State Universities,” The Journal of Blacks in Higher Education, 13 (Autumn, 1996); Connie Street, “Black history pioneer: Alexander Clark became prominent achiever while residing in Muscatine,” Muscatine Journal, February 24, 2006.